Are tuition fees really the only way to improve the German university system? According to German politicians, this seems to be the case. 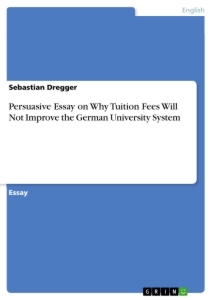 They argue that only tuition fees can increase the financial resources of the bad-equipped German universities and that a tuition-based university system would force students to study more efficiently and to graduate much faster from college than they do today. However, knowing the German university system from my own experience, I am not convinced that charging tuition fees is the right way to improve one’s studying conditions. Therefore I will argue that tuition fees won’t improve the financial budget of universities; that there is – contrary to what the supporters of tuition fees say – a tax-based alternative to raise the budget of the universities; that a more stringent curriculum means a severe restriction of academic freedom, and that, last but not least, the introduction of tuition fees would set a very alarming precedent towards a plutocratic fee-society in which many democratic rights are limited to only those people who are able to pay for them. At first glance, it seems quite convincing that tuition fees would raise the university’s budget. But this argument ignores the bad situation the German state budgets are in: they are badly indebted so that each government – no matter whether is a conservative or liberal one – tries everything to cut public expenses. This implies that the budgetary surplus, resulting from tuition fees, will go hand in hand with a drastic reduction of state grants in the university sector, and in the end German universities will not have more money than today – despite tuition fees. What supporters of tuition fees constantly ignore is that there is a better way of financing universities than through tuition fees: namely by taxes. So, why is that one percent of Germany’s Value Added Tax not used to increase the budget of the universities? Such a tax- based financing has two major advantages when comparing it to a tuition fee-based financing: First, taxes are paid by all people whereas fees are only paid by a small group of people, the students; and when financing the university sector with a common tax, this implies that all people have potential access to a university, whereas financing universities by mere student tuition fees implies that only those paying the fee have legitimate access to higher education with the consequence that in future poorer people will be excluded from the German university system. Second, as taxes are collected by percentages, they regard the different financial power of poor, average and rich people because 1% of 1000 Euros is much less than 1% of 100,000 Euros so that the person only possessing 1000 Euros has to pay much less money in taxes. Tuition fees, however, totally disregard one’s personal financial situation: The obligation to pay 500 Euros per semester has to be paid by every student – no matter whether his/her parents are millionaires or dishwashers. Besides, supporters of tuition fees argue that having to pay money for every semester at university would evoke the need for new and stringent university courses so that students could graduate earlier, and consequently they could start their professional lives sooner. But are stringent, that is tuition-based curricula really what constitute university education? I do not think so, as they primarily restrict academic freedom in several ways: First, once students have started studying, they will not be able anymore to change their major subjects, if their realize – for whatever reason – that their skills and interests do not meet the requirements in their subjects, because the average student will not have the money necessary to spend some additional semesters at university. Second, the necessity to pay fees will lead to the fact that students will not be able to attend any additional classes complementary to their major subjects. For instance, have you ever wondered why so many students from the English speaking world are not able to speak at least one foreign language? The reason is: They cannot afford to learn foreign languages besides their major subjects over three or four semesters in a university system based on painfully high tuition fees. Apart from that, having to choose which subject they want to study, students in a fee-based system do not follow their personal interests – rather they focus on subjects with which one can most likely make lots of money. In the long run, this means that smaller, more exotic subjects, especially most of the humanities will not be studies anymore by enough people; these subjects will be marginalized in the academic world which, then, will only consist of business, medicine, law and some applied sciences. The Federal Joint Committee in the German health system. Political accountability deficit caused by a decoupled government institution? Cloud 2025. Will Near Field Communication be (or not) part of standard off-the-shelve Cloud offerings in 2025? Groups of charging for packaging waste. Are product-linked waste fees a more efficient way to reduce waste? What Key Disruptive Effects Have and Will the Internet of Things or Physical Computing Have on Business and our Daily Lives?